It would be hard to pack more adventure, wildlife viewing and cross-cultural experiences into an eight day program than this. Students taking part in our Grizzlies & Glaciers study adventure will fly above the spectacular Coast Range of British Columbia during transport from Vancouver to norther B.C. and return. Within minutes of landing they will be welcomed into a local community and learning about the native history of this land. 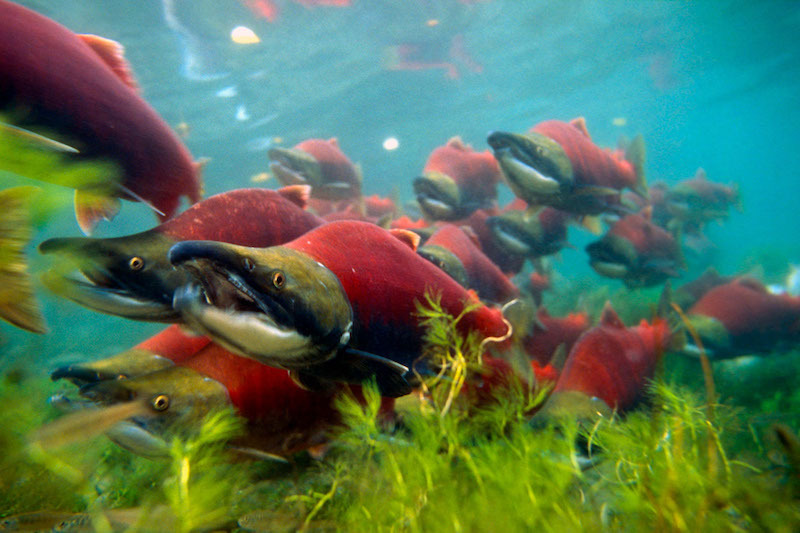 Students will witness native fishermen gaffing salmon at waterfalls using techniques that have changed little in 10,000 years.Visiting native villages, they will discover the world’s oldest totem poles and the descendants of the masterful native carvers that crafted them. 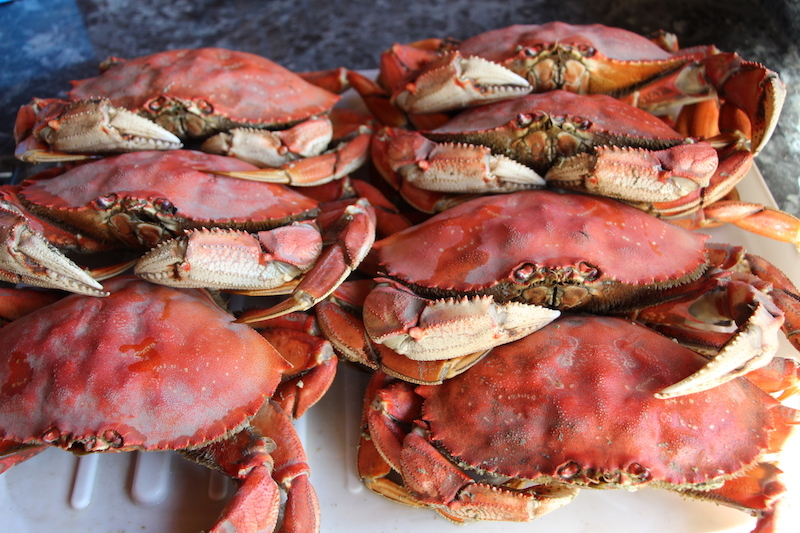 They will have opportunities to catch, clean and smoke their own fish following time-honored and harvest garden fresh vegetables and berries at the ‘off the grid’ Soaring Spirits camp, learning how to live off of the land and become a sustainable citizen. 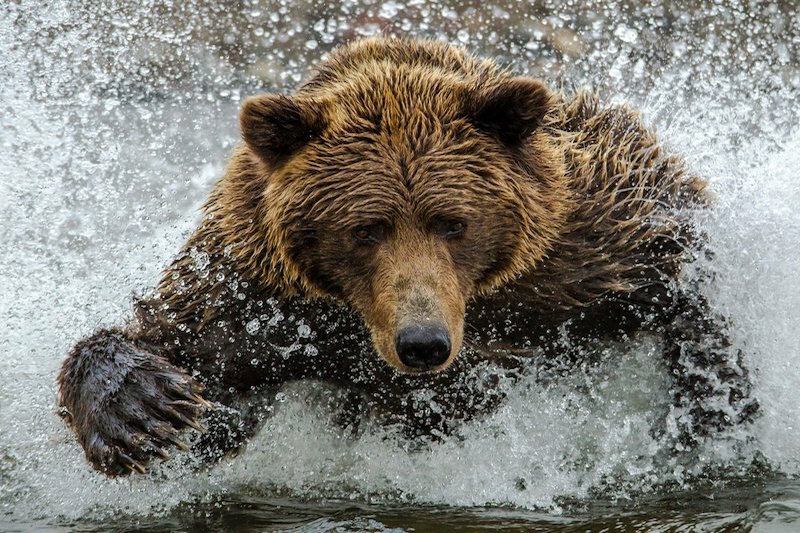 Heading north to Alaska, we visit one of the best viewing locations in the world for safely watching grizzly bears feeding on salmon, and we learn lessons in glacial geology by hiking to the base of one of North America’s largest glacials fields. Not far away is the lava covered landscape of Canada’s most recent volcanic eruption, a cataclysmic event that buried sever Nisga’a native villages. Heading to the coast, we will spend a night in the bunkhoust of the oldet salmon cannery on the west coast of Canada, now a National Heritage Site. If there’s a better way to experience the wonder and majesty of this Great Land, we’ve yet to hear about it. After a spectacular flight over British Columbia’s Coast Mountain Range, the largest granite complex in the world, students will share in a welcome picnic at Kitselas Canyon National Historic Site, just 15 minutes from the airport. Here students will learn about the fascinating history of the Tsimshian peoples who occupied this canyon for over 6,000 years and received trade items in toll payments from other tribes wishing to pass through the canyon on dugout canoe journeys up and down the Skeena River. Ancient petroglyphs, abandoned dug out cedar canoes and totem poles displaying the heraldic crests of their owners will all be part of this initial cultural immersion experience. 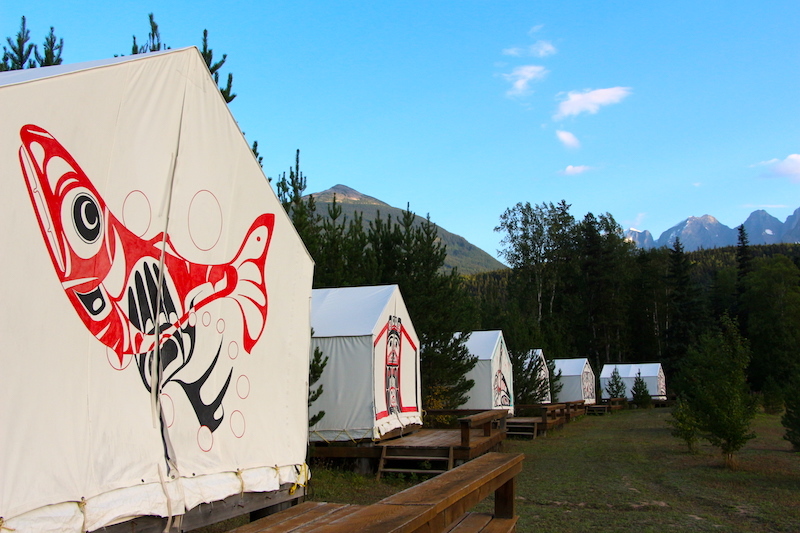 After a tour of the beautiful 175-acre camp along the banks of the Ksan (Skeena) River, students and teachers will check into large canvas wall tents on cedar platforms then head to the dining hall for a traditional Gitksan welcome feast. Following the feast, Gitksan Chiefs will formally welcome students to their territory in an opening ceremony at the camp Council Fire. After a wholesome organic breakfast from the camp’s garden and hen house, students will have a few simple camp chores to assist with before starting a full morning lesson in organic gardening. Site selection, soil type, use of crop covers, composting, mulching, weeding, companion planting, crop rotation and natural means of protecting crops without the use of insecticides or herbicides will be part of the lessons. Later in the afternoon, students will take hikes in the forest to learn how to identify and harvest wild foods like hazelnuts, Saskatoon berries and mushrooms as well as learn traditional medicines like pitch from Balsam fir trees for treating wounds and ‘chagga’ from Birch trees – the “Gift of the Gods” that Siberians used for centuries to ward off illnesses. The whole day comes together at dinner time when students help prepare a meal featuring fresh organic produce from the garden and wild foods from the land. After dinner chores, everyone will gather for large group games in the field and stories around the council fire. Students will perform a few simple camp chores this morning after breakfast. In doing so, they will learn how Soaring Spirits camp operates off the grid with just six solar cells and batteries, and how all toilets in camp are composting units that reduce water consumption and produce ‘humanure’ for tree fertilier. With camp chores completed, we now set off with a picnic lunch to tour the traditional territories of the Gitksan and Wet’suwet’en peoples. Just a short drive from camp we will see some of the worlds oldest and most beautiful totem poles at Kitwanga village. Nearby we will explore Battle Hill – a National Historic Site where the Gitksan built one of the world’s most ingenious defense fortresses. From Kitwanga, we drive 45-minutes East to Moricetown to view Wet’suwet’en people gaffing and netting salmon from the raging falls and rapids of the Bulkley River as their ancestors have done for countless centuries. Driving east another 20-minutes brings us to Twin Falls cascading out of the rapidly receding glaciers of Hudson Bay Mountain. Here students can hike to viewpoints to see effects of global warming before their eyes. Returning west, we come to Ross Lake where students can enjoy a swim in a beautiful lake while having an afternoon picnic. 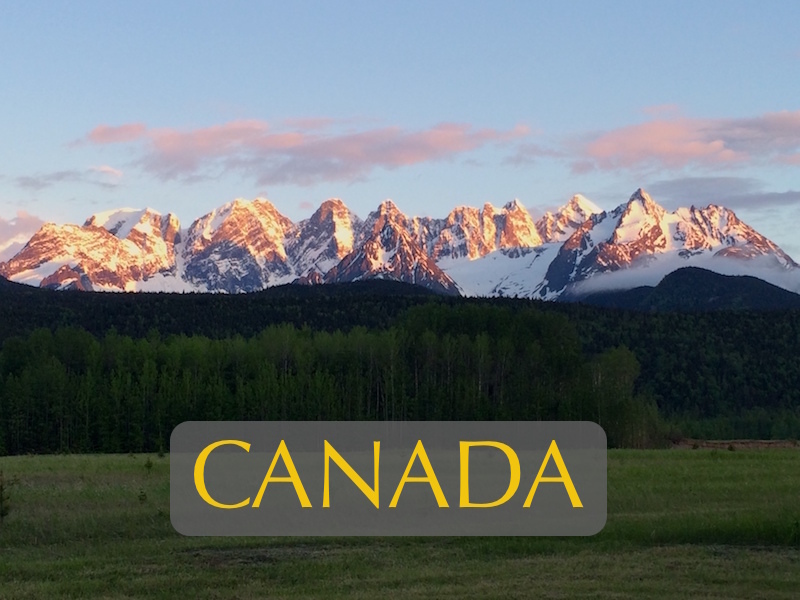 Later in the afternoon we visit Old Hazelton – a quaint pioneer town that is theoldest settlement of non-natives in Northern BC, and Ksaan – a recreated Gitksan village. Ksaan Cultural Village at the confluence of the Bulkley and Skeena Rivers is a world-class attraction offering insights into the rich complexities of Gitksan culture. A guided tour through the longhouses of this site will teach students about the potlatch system where all official business was conducted prior to government laws forbidding it. 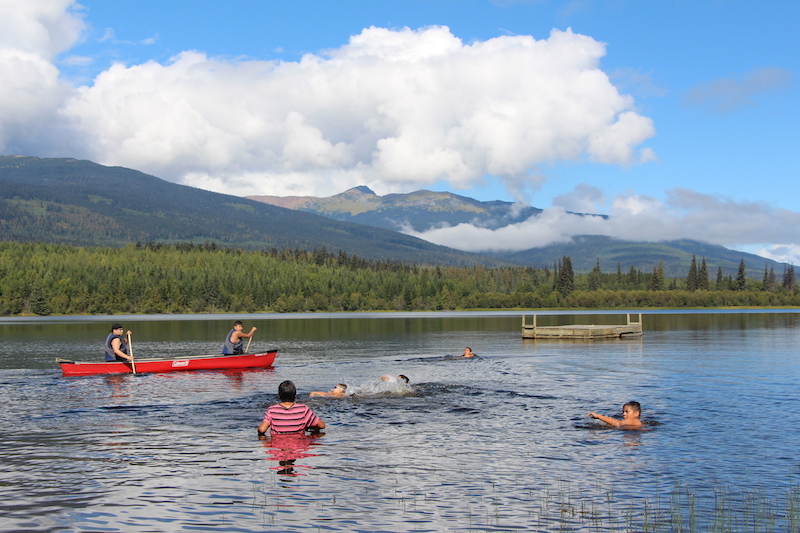 Before returning to Soaring Spirits Camp, we will stop briefly at Seeley Lake (the location of an ancient Gitksan legend) to learn how native stories are regarded as “true tellings” of historic events, increasingly backed by scientific evidence. Returning to camp we will enjoy a BBQ dinner before gathering around the camp council fire to share thoughts on the day’s experiences. After breakfast we pack up and set off by vehicle for a 2 hour drive north along Highway 37 to Alaska. Our first stop will be Gityanow a small Gitksan village that displays some of the worlds oldest and most intricately carved totem poles. Driving another hour north we arrive at the beautiful shores of Meziadin Lake for a picnic lunch and an opportunity to swim in the crystal clean, but cold waters. 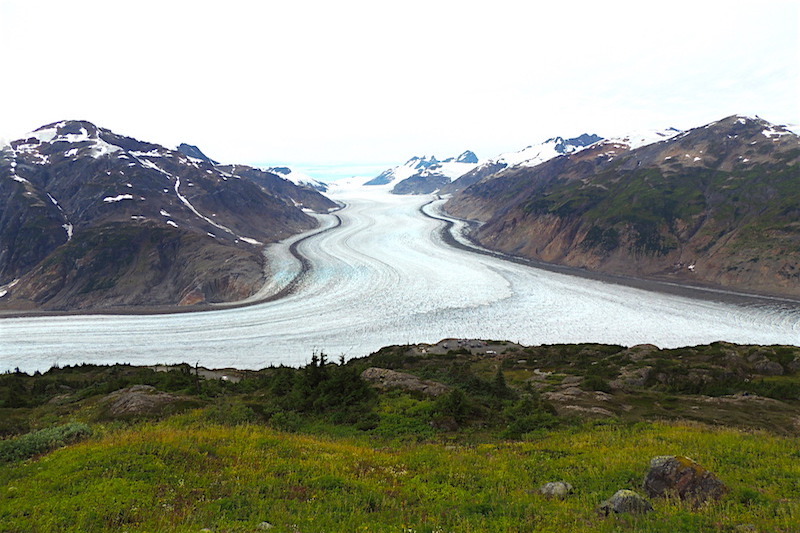 The final drive from here to Stewart is one of the most scenic in north America, passing Bear Glacier and ending at the head of Portland Canal – the longest fiord on the Northwest coast and the international boundary line separating Canada from Alaska. After checking into our accommodations, we will have time to explore an estuary by boardwalk and learn about this very important ecosystem for waterfowl, marine organisms and grazing grizzly bears. 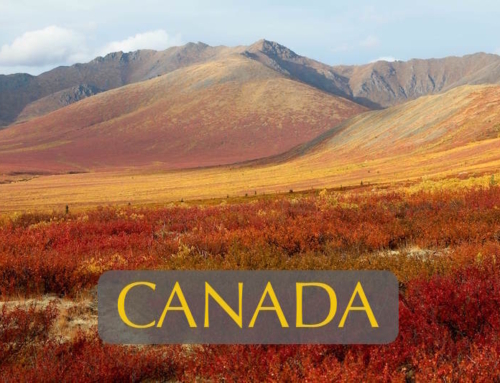 After taking some time to explore the old Gold Rush town of Stewart, B.C we will cross the border to the twin Gold Rush town of Hyder, Alaska. A short drive out of Hyder, we come to an elevated cedar walkway where we can view in safety grizzly bears that come to feed on the world’s largest chum salmon in Fish Creek. There are few locations in the world offering a better observation place to study natural bear behavior in safety. We can linger here as late as we like before returning to our camp for dinner and a good sleep. 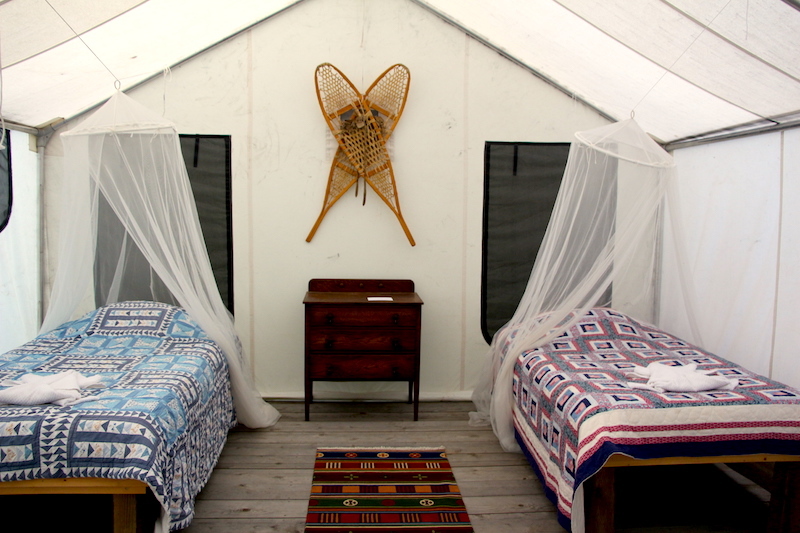 Overnight: Ripley Creek Inn, Stewart B.C. After breakfast at our camp, we set off early to Fish Creek for morning wildlife viewing. 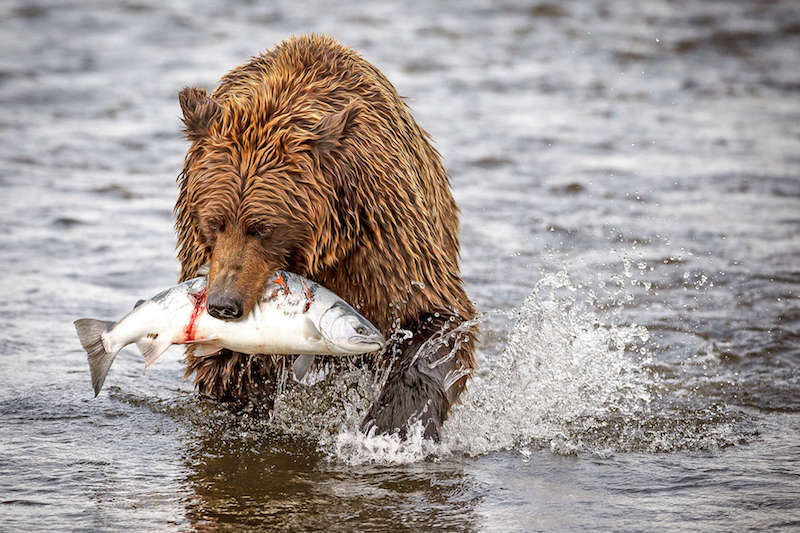 Grizzlies, black bears, wolves and beaver are all possibilities at this prime time of day, but spawning salmon, gulls, eagles and waterfowl sightings are almost certainties. We then drive a spectacularly scenic gravel road to Salmon Glacier, the largest glacier in the world accessible by vehicle. Along the way we will stop for lessons in glaciation. Students will all see for themselves what a lateral, medial and terminal moraine look like as well as other glacial features: ‘horns’, ‘circues’, ‘nunataks’, ‘kettle lakes’ and ‘errants’. A picnic lunch will be enjoyed while overlooking the vast sweep of the glacier before we set off on a hike to explore the unique flowering plants of the alpine. Here students will see how plants adapt to extremely harsh conditions and short growing seasons. They may also find some snowfields for a mid-summer snowball fight and bum sledding. Returning down the mountain we will have one final stop at Fish Creek for wildlife viewing and an opportunity to shop for Alaskan handicrafts before crossing the border back into Canada. Returning to our camp in Stewart in the early evening we will have good campfire dinner and talk around the fire. After breakfast at our camp we will break camp, depart Stewart and head for the Nass valley home of the Nisga’a tribe. 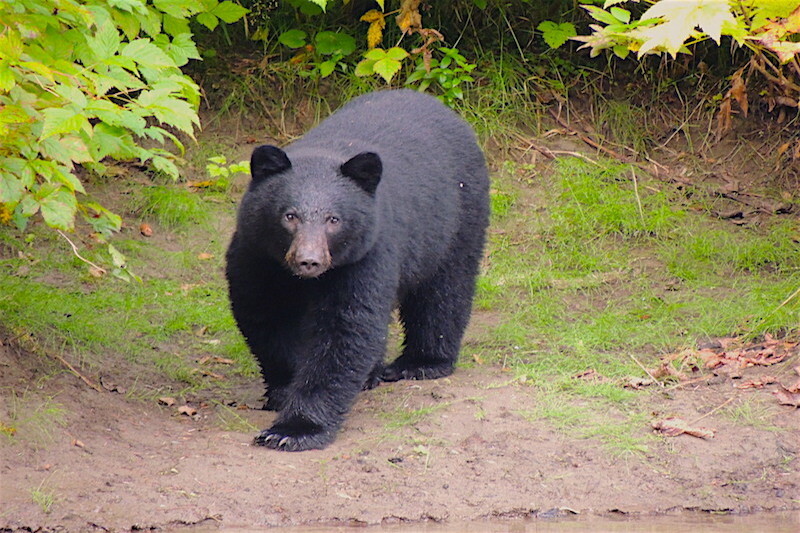 Taking a 50 km back road along the Cranberry River we may have opportunities to see black bear and kermode bear – also known as the white “spirit bear”. After a toilet and refreshment stop in New Aiyansh, the center of governance for the Nisga’a Nation, we will drive through massive lava beds. Our next stop in Nisga’a territory will be at an interpretive center that tells the story of Canada’s most recent volcanic eruption that buried three Nisga’a villages. We will stop at Gitwansilk to cross the Nass River on a suspension bridge to view fish wheels and see where the lava flow came to a dramatic stop. Driving further down the Nass valley we come to the Nisga’a village of Laxgalts’ap and the world class Nisga’a historical museum that displays the rich heritage of this fascinating culture. After taking some time to view the amazing museum collection, where students will gain a deep appreciation of Nisga’a culture, we drive down to the coast and the isolated Nisga’a village of Gincolith. Here we will be hosted by one of the most gracious and hospitable communities to be found anywhere. A traditional feast in the community longhouse will be a highlight of our stay here. Early risers may want to stroll the Gincolith waterfront walkway this morning to see gatherings of eagles, ravens, crows and seagulls, or search for grizzly bears and their cubs from the bridge over the village creek and estuary. After a home-style breakfast we say goodbye to our host community and drive through the scenic Nass valley with a stop at Vetter Falls and Lava Lake for a possible refreshing swim. We then drive on to Exchamkis Provincial Park for a picnic lunch and a stroll through a spectacular old growth forest featuring giant Sitka Spruce, Western Red Cedar and Western Hemlock trees. Students will be amazed how massive the trees are here in this coastal forest compared to the interior forest. A lesson will be offered in how salmon contribute to the phenomenal size of the trees here based on Nitrogen 15 analysis of tree rings. From here it’s an hour and a half drive along the Skeena River to our destination for the day. 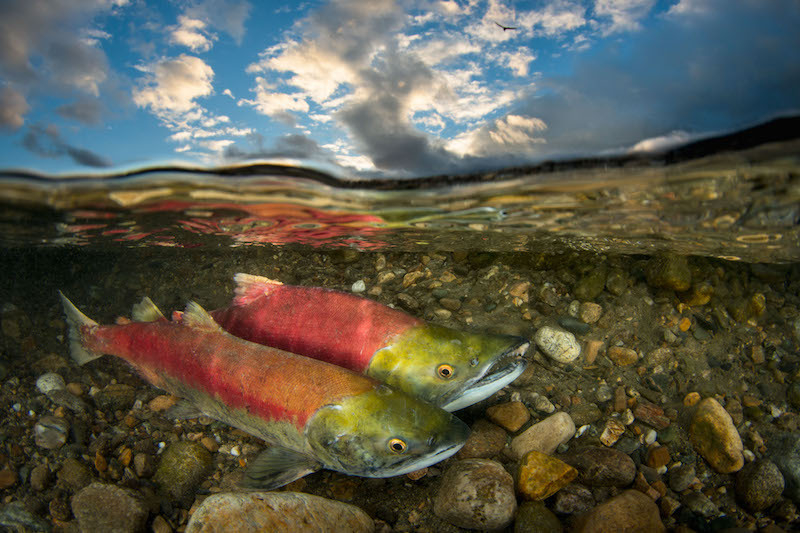 The Skeena, known by the Gitksan and Tsimshian as the Ksan – the “River of Mists” – offers one of the only drives in North America with a five star rating in the Michelin Guide. Along the way, students will have pointed out to them some of the classic features of a deeply glaciated, U-shaped river valley. Arriving at North Pacific Cannery we have an opportunity to tour the oldest intact cannery north of the Columbia River. It was established in 1889 and ran continuously for almost 100 years. We will learn about the housing of different cannery workers from various Native Nations to Japanese and Chinese as well as see the canning process. The Port Edward Historical Society has been carefully restoring this site for years and they welcome assistance. International school students in previous years have contributed significantly to the preservation of this site. Tonight we bed down in a historic bunkhouse used by cannery workers and enjoy dinner in the mess hall. This will offer a full and historic immersion experience for students into a bygone era. Tonight we will have our closing ceremony on the grounds of this historic site. After breakfast the group will transfer back to Terrace for the return flight to Vancouver.